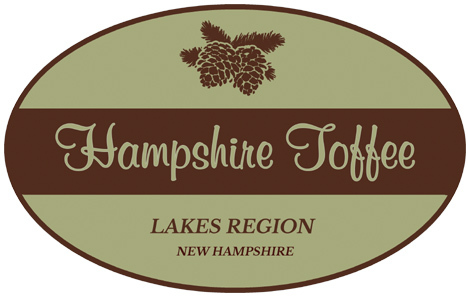 Welcome to the sweet world of Hampshire Toffee. This gourmet New England toffee is a personal recipe, built upon the savory combination of the finest, all natural, gluten-free ingredients: sweet cream butter, premium Ghirardelli chocolate, California roasted almonds and just the right amount of sea salt. We specialize in three delectable products: our signature Almond Toffee with semi-sweet chocolate, plain butter toffee with semi-sweet chocolate and sea salt, and Toffee Pop - a mouthwatering combination of toffee and non-GMO popcorn (not your typical caramel popcorn)! By offering only these three exceptional products, we make it easy to buy the best gourmet toffee, and are confident you will be very happy to share our handcrafted toffee gifts with friends and family, or to order as a treat for yourself.